Derrick Rose of the Chicago Bulls, during Thursday’s game against the Los Angeles Clippers. On Thursday night in Chicago, the Bulls were clinging to a 4-point lead over the Clippers. With 50 seconds left, Derrick Rose ran off some clock near midcourt; as the shot clock hit 14, he used a Pau Gasol ball screen to beat Chris Paul to the elbow and attack the right side of the paint, where he was met by DeAndre Jordan, one of the most athletic rim protectors in the league. But Rose was undeterred — he burst from the elbow toward the right block, elevated (at least a little) and banked in a gorgeous runner to put his team up by 6 with 45 seconds left. Vintage Rose. Here was the blend of speed, smarts, touch and fearlessness that once made Rose an MVP. It was the exact kind of play we used to expect from him on a nightly basis — making the biggest shot in the biggest moment of a nationally televised game. But plays like this — with Rose probing, attacking, succeeding — have been rarities this season. Simply put, Rose hasn’t been himself; he’s more passive than we’ve ever seen him. More simply put, Rose has been bad, and so has the offense he helps to run. As of today, the Bulls are 12-8, which is by no means terrible, but Chicago came into the year expecting a return to contender status in the East, thanks to a newly refurbished offense. Instead, the team is winning in spite of its offense, trotting out one of the most anemic attacks in the entire league. The Bulls offense currently ranks 29th in offensive efficiency, scoring just 97 points per 100 possessions. We’re 20 games into the season and the “Fred Hoiberg Offensive Awakening” is still hitting the snooze button. The Bulls brought in Hoiberg this June in part to help finally unlock the sleeping offensive beast in the Windy City. After years of offensive repression under Tom Thibodeau, the pace-and-space explosion of a team with exciting young players like Jimmy Butler, Nikola Mirotic, Bobby Portis and, yes, Rose, was supposed to be downright tantric. It hasn’t happened yet. While the Bulls have pumped up last year’s bottom-10 pace rating to a top-10 figure, this year’s offensive model is significantly less effective than Thibodeau’s last iteration, which put up 104.7 per 100 last season, making the Bulls the 10th-best offense in the league. It’s hard to transform a team that was the 10th-best offense into the 29th, especially considering almost all the players are still in place. The Bulls have accomplished (?) 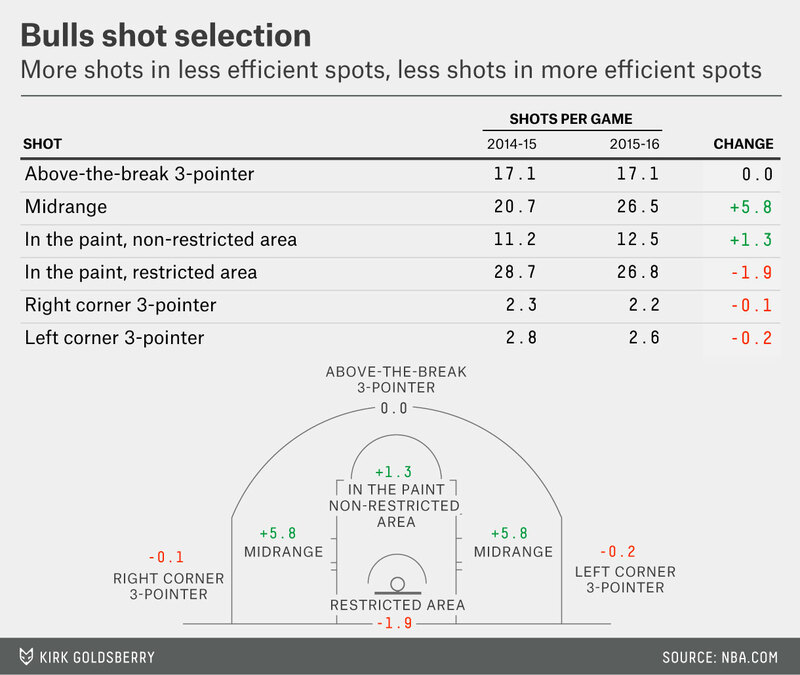 this in part by dumbing down their shot selection. Looking at their shots per game around the court, they have increased their midrange shooting activity under Hoiberg while decreasing their restricted area and corner three activity. Shot selection isn’t the only component of offensive efficiency, but these questionable shifts in the Bulls’ shot diet have unsurprisingly contributed to the downturns in their points per possession numbers. Of course, team shot selection doesn’t happen in a vacuum, and here’s the thing about bringing pace-and-space, or any other high-octane offensive revolution, to Chicago: Derrick Rose is still the face of the franchise, and right now that face is broken. It’s sad to say, but Rose is among the least efficient players in the NBA this year. He has a player efficiency rating of 9.89 and is one of only a handful of players putting up negative win shares per 48, and the arc of his CARMELO projection looks like a stack of printer paper. It’s hard to look sharp when your face is busted. Just look at those midrange regions. At his peak, Rose was one of the most efficient midrange jump shooters in the league. So far this year, 68 players have taken at least 250 shots, and within that group, Rose ranks 66th in field goal percentage, outshooting only the decomposing Kobe Bryant and the very green Emmanuel Mudiay. But Rose is 27, a former MVP, and squarely in a time when his midrange game should be getting better, not worse. Or take the at-the-basket region — 79 players have attempted at least 100 shots within 8 feet of the rim this season, but Rose ranks dead last in efficiency in this group. It’s alarming, and the clearest sign that Rose simply isn’t close to being the player he was. In his MVP year of 2010-11, Rose converted 54 percent of his buckets in this same area. And before you go saying that this drop has more to do with his loss of explosiveness because of the knee injuries and less to do with that face injury, consider that last season that number was 55 percent. 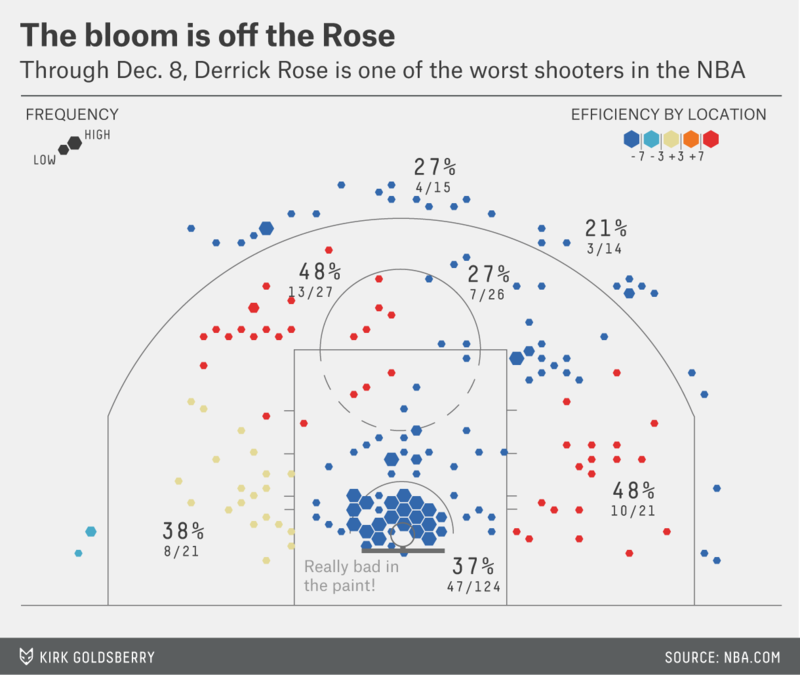 Additionally, Rose’s passivity shows up in his lack of trips to the free-throw line. He’s currently getting there just 2.8 times per 36 minutes, which would be the lowest mark of his career — which is saying something, considering his early-career aversion to contact. It’s also less than half of the level during his MVP campaign, when he went to the line 6.6 times per 36 minutes. This is strange, because Rose is actually driving more often this year. Going by the SportVU “Drive” stats, Rose drives 9.5 times per game, compared with 7.2 last season (we don’t have data going back to his MVP season). However, his points per possession have fallen from a respectable 0.83 last year to a disastrous 0.58. Performance as bad as Rose’s on drives can submarine an entire offense. Data from Synergy says Rose is running pick-and-rolls on 41.5 percent of his possessions, up from 32.3 percent last season. That’s a big number of possessions eaten up by a guy who poses zero threat going to the cup. That means that even though Rose is passing more off of his drives (26.9 percent, up from 19.3 percent, per SportVU), he isn’t terrorizing the defense into giving up its shape, helping to create the “space” in a pace-and-space offense. No amount of Pau Gasol post-ups can paint over so many possessions being doomed before they even begin. The good news is that (as you may have noticed in that Vine above) Rose didn’t wear his mask in the second half Thursday night, and after being held scoreless in the first half, he finished with 11 points, 2 from that huge floater that helped seal the win. Maybe it’s hokey, but maybe that mask symbolized the latest setback for Rose, and perhaps its removal means that Rose can get back to being at least an approximation of Rose again and that Hoiberg can get on with the awakening. While it’s tempting to say that Chicago’s offensive woes are proof that Hoiberg and the new coaching staff are lost, it’s also only December, and the team is 12-8. Chances are they are only going to get better with time. Hoiberg’s pace experiment may still prove to be a bad idea for this group, but when your star point guard can’t see straight, it’s hard to discern tactical failures from executional ones. And if Thursday night is any indication, maybe the Bulls are ready to take off the mask and start getting buckets again.